Our Leadership - Jewish War Veterans of the U.S.A. 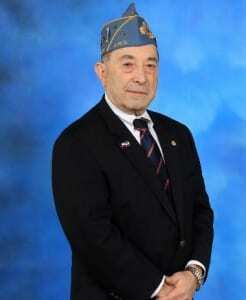 The Jewish War Veterans of the USA is delighted to announce that Dr. Barry J. Schneider was elected as National Commander at the 123rd Annual National Convention in Tampa, Florida. Barry is a retired Air Force Major with 20 years of active military service. His assignments included: NORAD IG Team; Combat Crew Commander; Instructor Crew Commander and Standardization Evaluator for both Titan II and Minuteman Strategic Missile Weapon Systems; Commander of the 44th Strategic Missile Wing Headquarters Squadron and the Chief Administrative and Logistic Services at the Morocco US Liaison Office United States Embassy in Rabat, Morocco; Commander of the 57th Fighter Interceptor Headquarters Squadron in Keflavik, Iceland and Commander of the 7th Combat Support Group Headquarters Squadron in Texas. He graduated from the Squadron Officers school, Air Command & Staff College, Command Staff Officers course and Defense Institute for Security Assistance Management. In 1994, Barry joined the Jewish War Veterans, Post 755 in Fort Worth, TX and became a Life Member. He is also a life member of National Museum of American Jewish Military History (NMAJMH). He served as Post Commander from 2005-2007 and received the Post Member of the Year Award in 2007. He served as Department Commander for Texas, Arkansas, Louisiana, and Oklahoma (TALO) from 2012-2014 and National Executive Committee member from 2014-2016. He developed and organized two JWV Posts in Oklahoma City, OK and Shreveport, LA in 2013 and a new Ladies Auxiliary in Fort Worth, TX in 2016. Barry serves/d as Chairman of Vietnam Veterans Committee, Chairman of the Scouting Committee, Vice-Chairman of the Youth Achievement Committee, Convention Committee member, Personnel Committee member, Resolutions Committee member, Awards Committee member, NMAJMH Representative and the JWV Representative at the annual Jewish Warrior Weekend at Texas A&M 2017 and 2018. Barry has been a lifelong Boy Scout. As a youth, he earned the Eagle Scout award and the Ner Tamid Jewish religious emblem. As an adult, he served as Assistant District Commissioner for BSA Transatlantic Council in Turkey and Morocco. He was awarded the Silver Beaver award for sustained exemplary service and the Shofar Jewish religious award for service to Jewish Scouting. Barry was selected to serve as a staff leader at several National Jamborees working in the Jewish emblems booth, director of the Kosher kitchen and teaching Reading Merit Badge. The Jewish Community is paramount to Barry. He was selected as the B’nai B’rith Jewish Person of the Year for Fort Worth and Tarrant County in 2010. He has served as President of Temple Beth Shalom in Arlington, TX; President of Fort Worth chapter of B’nai B’rith; Campaign Chairman and President of the Jewish Federation of Fort Worth and Tarrant County; President of Men’s Club Congregation Ahavath Shalom, Fort Worth, TX; Vice President of the Tarrant County, TX Hebrew Free Loan Society; Vice President of the B’nai B’rith and Tarrant County Senior Housing complex in Fort Worth, TX. Barry serves/d as a Board member of the Fort Worth Jewish Day School and the Fort Worth and Tarrant County Jewish Family Services. In addition, he serves as Fort Worth Citizens on Patrol with the Police Department. Barry was a founding board member of the Orchard Theater of Texas, a nonprofit professional theater offering innovative and classic productions. Barry was born and raised in St. Louis, Mo. He was married to Dolores (Finkelstein) for 49 years. Dolores passed away in 2015. They have two children, daughter Myla and son Eric and two grandchildren. Myla and her husband Gary have two children, Eli and Coby. We wish Barry a successful year!